So, as rain turns to snow outside my window, I have begun the yearly process of trying to heat the house with tea. It works, somewhat. After a gloriously warm and dry fall, we are finally getting some cold weather. We live in an older house, a mid-century-fabulous, low-slung ranch, with huge windows facing East and West in the living room. Love the house, but it isn’t very draft proof. DH said something about using a stick of incense to find the drafts in the front window, and I said, “Oh, so you can caulk the cracks?” He looked shifty eyed- he hadn’t thought about it that far. We don’t have a caulking gun, so it would involve a trip to Home Depot. Home Depot is a place that makes DH very uncomfortable. So, I am heating my house with tea. In the past I have tried heating with a pot of soup, simmering away all afternoon. I have also tried it with chocolate chip cookies, but I’d like to be able to zip my ski pants, so instead, it’s tea. Before I got my electric tea pot, I used to fill the kettle, turn it on high, walk away. When I eventually returned, it would be boiled away. I would have heard the whistle, if the whistle hadn’t broken. This runs in the family. My dad would do the same thing, walk away, get caught up in something, and when he came back, the pot would have boiled dry and started to melt. He burned through the bottom of several tea kettles this way. Eventually, he started making tea in the microwave. This has been suggested to me, but with the microwave you don’t have the advantage of heating up the house as well. 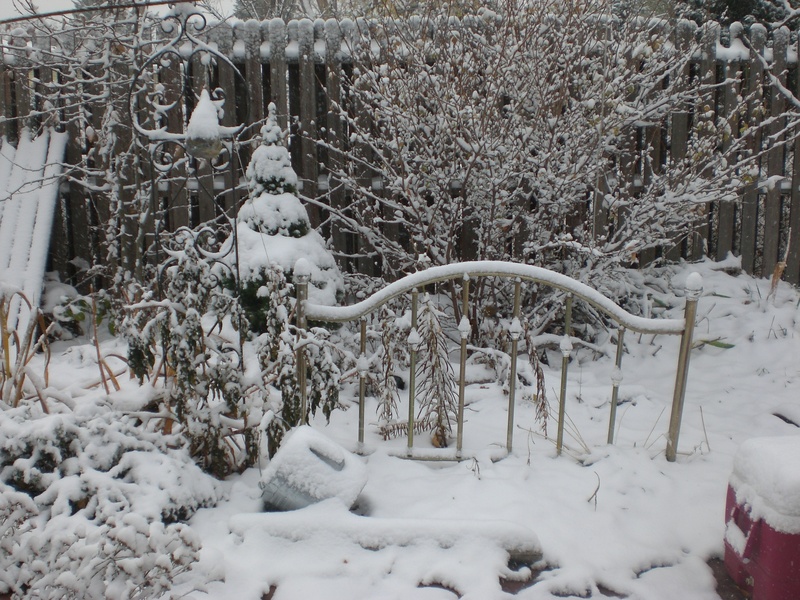 To me, winter interest means it looks good through a window, covered with snow, while I drink tea. 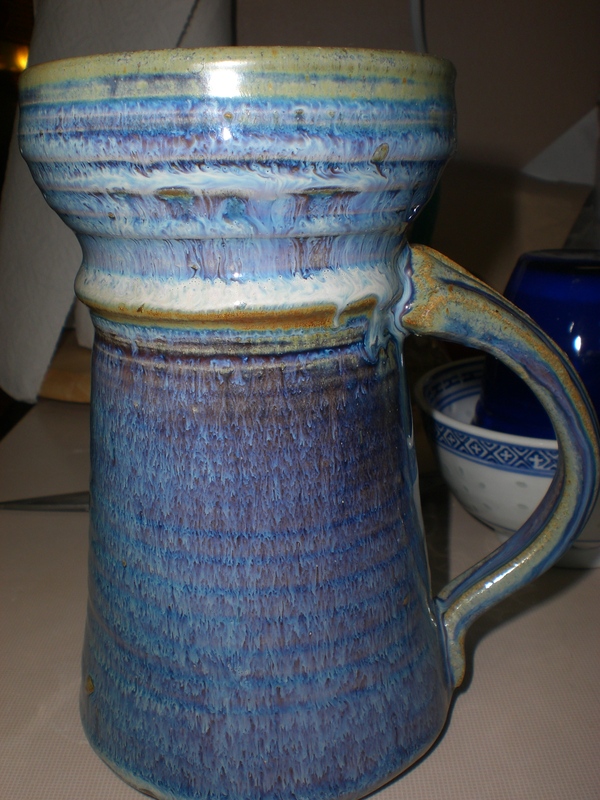 The tea finally cools enough to drink, and the pottery mug keeps it warm for a longish time, but by the time it is half done, it is too cold, so, I turn on the kettle again, go to the bathroom, and when I get back the water is hot, and I refill. Now, here is the beautiful part, since it is half cold, the tea is just right, immediately, so with the second round, I don’t have to wait as long. The tea might be weak, though, so I tip some more sugar in from the bowl, and add another tea bag. The process repeats itself all afternoon, all winter. 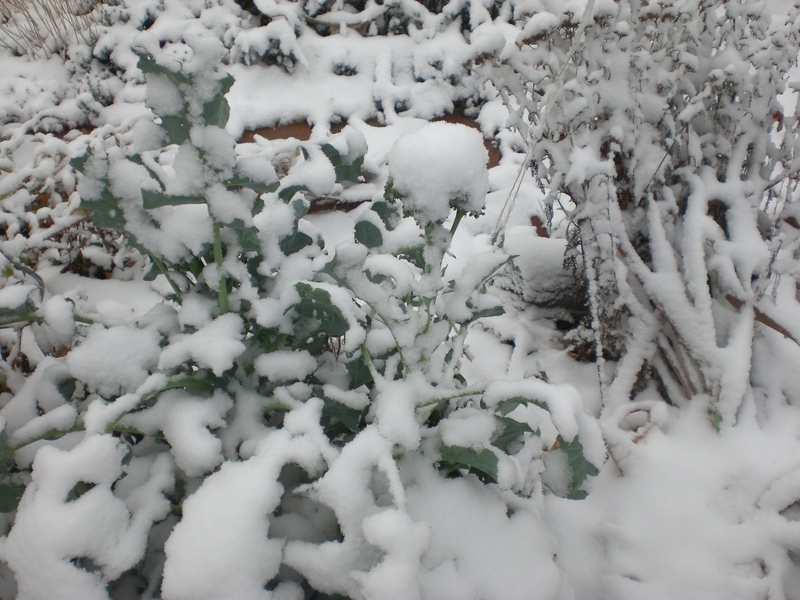 This is a broccoli plant- and after the snow melted, I actually picked the broccoli- and it's fine! Previous Ode to Smoked Paprika Next Forcing tulips to do what?